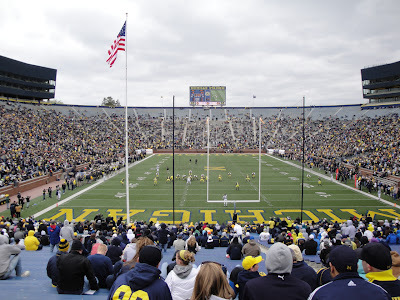 ANN ARBOR – The 2011 Mott Spring Game presented by PNC Bank featuring the University of Michigan football team and its alumni is less than three days away and the program hopes to exceed the estimated crowd of 50,000 fans that watched last year’s final practice at Michigan Stadium. The spring game is free to the public, but the football team and C.S. Mott Children’s Hospital have partnered in a fund raiser for the new hospital scheduled to open in Fall 2012. The gates to Michigan Stadium will open at 9 a.m. EDT. The third annual alumni flag football game begins with introductions at 10 a.m. The 132nd team in school history will take the field for warm-ups at approximately 11:20 am. The final spring practice will start at noon EDT and will be broadcast by the Big Ten Network. All donations from Saturday’s spring game will go toward the Michigan Football Experience, an interactive play area for patients at the new hospital. The Beam Family of Brighton, Mich., has graciously offered to match dollar-for-dollar every donation that is made at the gates during Saturday’s activities. · $500 donation receives 2 pre-game sideline passes (does not include game tickets) to ONE of the following four games: Western Michigan, Eastern Michigan, San Diego State or Minnesota. · $750 donation receives 2 pre-game sideline passes (does not include game tickets) to the Nebraska game. For more information regarding the donations to Mott, please contact Stephanie Cloutier at (734) 936-9134 or slclout@umich.edu. Parking: The lots around Michigan Stadium owned and operated by the University of Michigan are free and open to the public. The U-M Golf Course Lot (Green) will be restricted to golfers only. Pioneer High School will be charging $20 for cars and $50 for RVs on Saturday. Gates, Restrooms and Concessions: The Michigan Stadium gates will open one hour prior to the alumni game at 9 a.m. All available restrooms on the lower concourse will be open and concessions will be available at several locations throughout the stadium. Locker Room Tours: Fans can tour and take photos in the Michigan team locker room from 5-7:30 p.m. on Friday (April 15) and from 7-9:30 a.m. on Saturday (April 16). Fans will have access to the stadium field on Friday night during the time devoted to the open locker room but the field will not be accessible Saturday morning because of the spring game activities. Desmond Howard Returns as Honorary Captain: Michigan’s 1991 Heisman Trophy and current ESPN College Game Day analyst Desmond Howard will be the Honorary Captain for the Mott Spring Game. Howard will be present for the alumni game, spring game and Mott Hospital functions. Victors Classic: Former U-M football players will be split into the maize and blue teams and will match wits in the third annual alumni flag football game starting at 10 a.m. Over 85 former football players from five different decades will participate. NFL Players to Attend Spring Game: Some of the current NFL players scheduled to be in attendance are Steve Breaston (Arizona Cardinals), Prescott Burgess (Baltimore Ravens), Braylon Edwards (New York Jets), James Hall (St. Louis Rams), Mike Hart (Indianapolis Colts), Marlin Jackson (Philadelphia Eagles), Zoltan Mesko (New England Patriots), Ryan Mundy (Pittsburgh Steelers) and LaMarr Woodley (Pittsburgh Steelers). Hockey Team to Receive Recognition: The Michigan men’s ice hockey team, the 2011 NCAA runner-up, will be honored during one of the breaks at the Mott Spring Game. The Wolverines played for the national title last Saturday (April 9), falling 3-2 in overtime to Minnesota-Duluth. The Wolverines completed the season with a 29-11-4 record this season and won the CCHA regular season championship. The Michigan Experience: New for the 2011 spring game is an interactive area for kids to participate in football activities. Located on the south concourse of the stadium grounds, there will be football related activities for kids, football character photos and a healthy kids area. Kick for Cash: The athletic department will randomly select one fan to attempt field goals with the chance to win a PNC gift card up to $300. They will have the opportunity to kick from three different spots, the 10-, 15- or 20-yard lines, with varying prizes for each of the three distances. Matt Giraud to Sign National Anthem: Former “American Idol” contestant Matt Giraud is going to sing the national anthem for the game. A Kalamazoo, Mich., native, he was born in Dearborn and graduated from Lincoln High School in Ypsilanti (2003). Radio Broadcast: Ann Arbor’s Sports Talk 1050 AM WTKA will have the exclusive broadcast of Michigan’s spring football weekend activities. Ira Weintraub and Steve Clarke will be broadcasting live from the booth and Sam Webb will be roaming the sidelines during the day’s activities. The station will begin broadcasting Saturday at 9:30 a.m. and carry the former player’s flag football game and the final spring practice in its entirety on its airwaves. Michigan Rewind: The athletic department’s online football recap show will have a complete highlight package and interviews with Brady Hoke and players available on MGoBlue.com following the conclusion of the final practice. Inside Michigan Football: The final show of the spring will air on Thursday, April 21, at 6:30 p.m. EDT. The 30-minute behind-the-scenes look at Michigan football will recap the spring game and all the activities surrounding the partnership with C.S. Mott Children’s Hospital. Big Ten Network Broadcast: Matt Shepard (play-by-play) and former Wolverine offensive lineman Jon Jansen (analyst) will broadcast Michigan’s spring game live on Big Ten Network starting at noon EDT. In addition to the practice game footage, the network will feature post-scrimmage interviews with head coach Brady Hoke and players.